Cast off on a thrilling expedition where elephants, gorillas, hippos and maybe even a headhunter await your arrival. Trek to a dusty tropical jungle outpost—laden with hanging cargo nets, wooden crates, timber canoes and rusty anchors—and board a weathered tramp steamer for an exciting adventure along a remote tropical river. Led by your trusty skipper, leave civilization behind as you navigate through treacherous waters rarely seen by man. Throughout your amazing voyage, take in lively narration from your friendly skipper, known for a brave heart and a clever joke… or two. Upon entering the covered boathouse dock at the front of the attraction, choose one of 3 queues indicating the language spoken by your skipper—Cantonese, Putonghua or English. Please note, all lines advance at approximately the same rate. 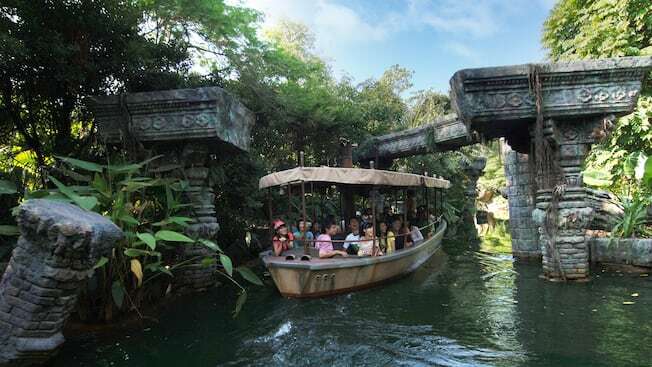 The original Jungle Cruise opened in July 17, 1955 at Disneyland Park in California. Based on Disney’s award-winning True-Life Adventure films, Jungle Cruise premiered with a more serious and educational tone. In the early 1960s, however, Walt Disney introduced more drama and lighthearted scenes and asked one of his most accomplished animators, Marc Davis, to sketch some humorous gags. Over the years, as the Jungle Cruise landscape has grown, so has the cast of animals. These updates, along with the talented skippers, provide fun new surprises on every trip down the river.